After the 2017 Santa Rosa, California fires, I found 2 people who were willing to donate their motorhomes for fire victims. But in the aftermath of the 2018 Paradise Camp Fires, I couldn't find any folks willing to donate their motorhomes. And the reason simply was because the many fires all over the State at relatively the same time had exhausted the supply of potential motorhome donations. So I decided to fundraise to purchase used motorhomes and donate them to the Paradise Camp Fire Victims. I personally handle all the logistics, including inspecting the motorhomes, vetting the fire victims, handling DMV paperwork, providing tax receipts to donors through Apostle City Ministries, Inc., a 501(c)3 approved Charity by PayPal, PayPal Giving Fund and Facebook. (PayPal.com/us/fundraiser/charity/3370790) Apostle City Ministries, Inc. EIN 83-0599867 provides authorized tax receipts while awaiting an acceptance letter from the IRS. Make all donations here at YouHelp.com. Thank you, I will personally respond to every donor. You can help homeless Paradise Camp Fire Victims get into their own private dwelling by making a substantial donation to allow us to purchase motorhomes for them, or by donating your motorhome today. We have assisted several families already but the need is still staggering. We need your help today! Mayor Rich Kinney has served his community since January 1999 as Pastor of an innercity Church, Police Chaplain, High School and College Assistant Basketball Coach, City Council Member since 2012 and now as a 2nd term Mayor. Mayor Kinney is also a Substitute Teacher and Founder, President and General Manager of a new faith-based Community Development nonprofit, Apostle City Ministries, Inc. Thank you for helping fire victims get into their own living situation. 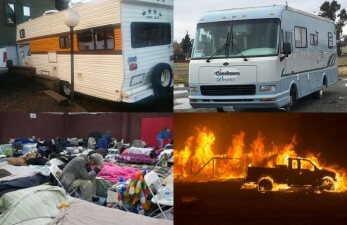 "More Motorhomes For More Fire Victims,"